On Sunday April 10th, 2016, Community Lodgings will host its 11th annual fundraiser, Spring Forward,from 5:00 - 8:00 pm at Union Street Public House, 121 S. Union Street in Alexandria, VA. This event will showcase the past 11 years of Community Lodgings’ commitment to the City of Alexandria and spotlight all the work we have accomplished. "This is going to be a fantastic event," said Lynn Thomas, Community Lodgings' executive director. "I'm particularly excited about the music and the live auction packages. I'm planning to bid on the Cancun trip myself. And I'm especially grateful to the Union Street Public House for their continual, generous support of Community Lodgings each year." The Philadelphia international recording artist The Intruders will headline the live music part of the program, and several local musicians will perform as well. Union Street Public House is once again donating their venue, food and staff. The event includes a dinner buffet and an open bar. Live auction items include a stay in a country cottage near Paris, a Cancun villa that sleeps eight and other adventurous prizes. The program portion includes the presentation of the Christopher M. McMurray Outstanding Program Achievement Award to a family that has excelled in Community Lodgings’ Transitional Housing and/or Youth Education Programs. Community Lodgings Spring Forward fundraiser would not be possible without the support of our generous sponsors including: Donna Cramer, McEnearney Associates, Equipment Leasing and Finance Association, Imaging Zone, Jack Taylor’s Alexandria Toyota, Your Dog’s Best Friends, BB&T Bank, Landmark Honda, Lynn and Michael Sauls, Nixon Peabody, Steve Wallace, and the Boyle Family. The cost per person is $50 in advance, $60 at the door and $40 to Community Lodgings volunteers and young professionals under the age of 40. Tickets can be purchased online at www.communitylodgings.org or by calling (703) 549-4407. All proceeds will support Community Lodgings’ mission to lift families from homelessness and instability to independence and self-sufficiency. Founded in 1987, Community Lodgings' mission is to lift families from homelessness and instability to independence and self-sufficiency through its transitional housing, affordable housing and youth education programs. 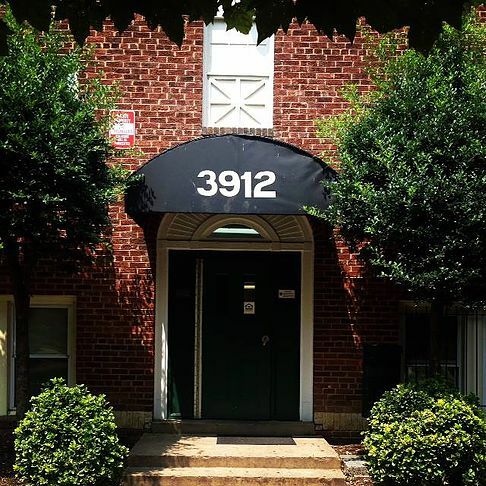 They offer 44 apartments at below-market rent, transitional housing and comprehensive support for up to two years for families transiting from homelessness, and challenging, educational afterschool, summer enrichment and mentoring programs for children. For more information visitwww.CommunityLodgings.org. 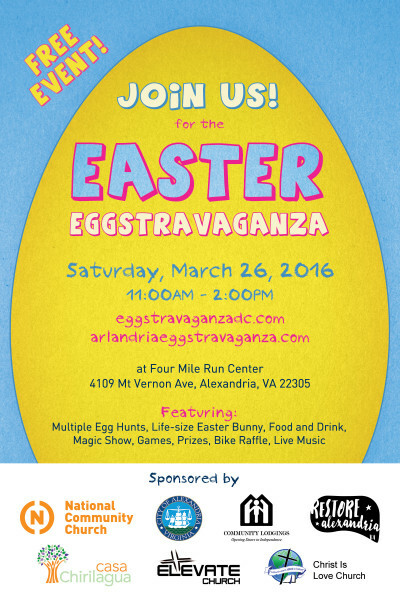 Everyone is invited to the 2016 Arlandria Eggstravaganza!! This years partner organizations include: Casa Chirilagua, The City of Alexandria, Community Lodgings, Elevate Church, Love of Christ Church, National Community Church,and Restore Alexandria. This is one of the most EGGciting Easter events in the Alexandria/Arlington area. The event is filled with entertainment, food, music, and of course an old fashioned egg hut with 1700 eggs. This family friendly event drew 1500+ people last year and has plenty to do now matter you age. It will be happening Sat. March 26 between 11:00 AM and 2:00PM. For more information go towww.arlandriaeggstravaganza.com or email arlandriaeggstravaganza@gmail.com. The Arlandria Action Plan Advisory Group will meet on Wednesday, March 16, 2016 at 7:00p.m., Cora Kelly Elementary School Library, 3600 Commonwealth Avenue. Discussion will include updates on projects in the Arlandria area, as well as a presentation by AlexRenew regarding the Four Mile Run Pump Station educational fence. The meeting is open to the public and community members are encouraged to attend. Spanish interpretation is available upon request by contacting Graciela Moreno, 703.746.3808. 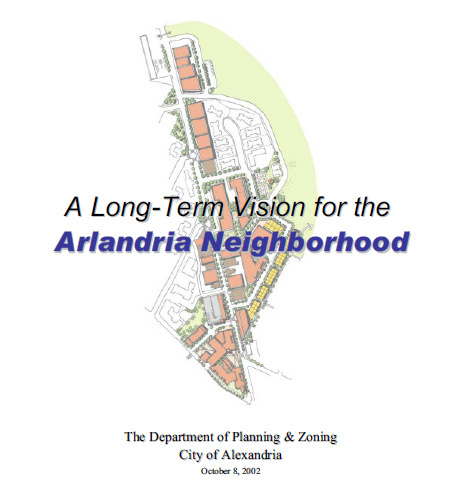 For additional information, please visit the Arlandria Plan Implementation website at www.alexandriava.gov/arlandria or contact Katherine Carraway, 703.746.3855. 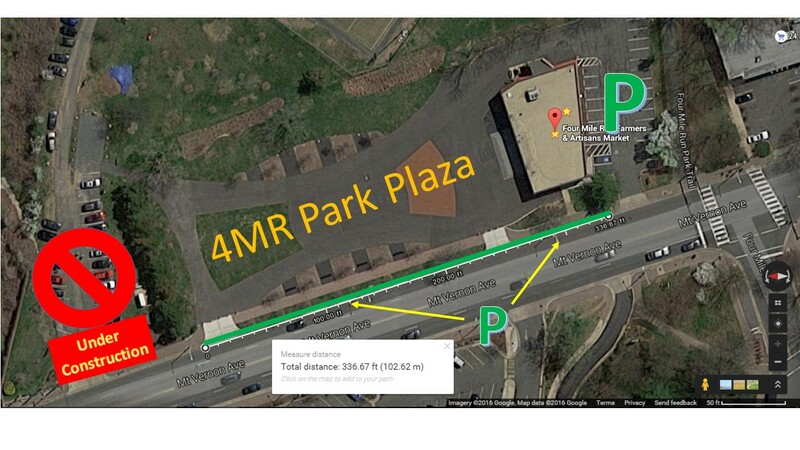 The City of Alexandria Department of Recreation, Parks & Cultural Activities will renovate the parking lot in Four Mile Run Park at Mount Vernon Avenue. Renovation activities will begin the week of March 7 and continue through mid-April. The parking lot will be closed during construction, and park and soccer field users may use the parking lot at the Conservatory Center located at 4109 Mount Vernon Ave. On weekends, additional on-street parking is available along Mount Vernon Ave. between the Four Mile Run Bridge and 4109 Mount Vernon Ave. The parking lot renovation will include twenty marked parking spaces on pervious pavers, a turnaround for drop-off and pick up, a rain garden and additional trees. This project is part of the Four Mile Run Restoration Master Plan, a joint effort between the City of Alexandria and Arlington County to make Four Mile Run into a model of urban ecological restoration through the sensitive and sustainable integration of a restored natural stream channel with an active urban environment. 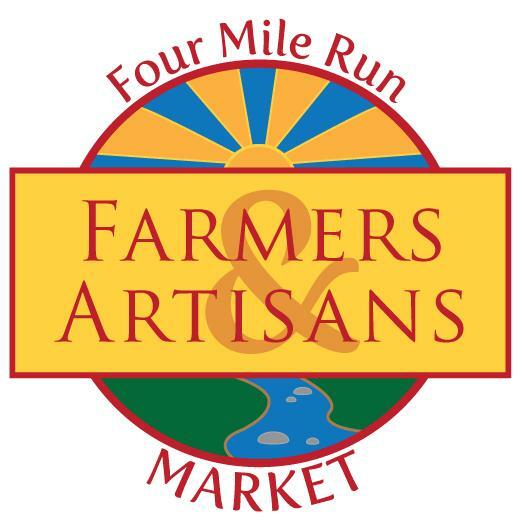 For additional information, visit the Four Mile Run Project website. For questions pertaining to construction, please contact Mike Gales, RK&K, on-site Construction Manager, at410.952.7686. For questions on the overall project, please contact Dana Wedeles, Park Planner, at dana.wedeles@alexandriava.gov or 703.746.5491. The renovations at Virginia Highlands Park are now complete! 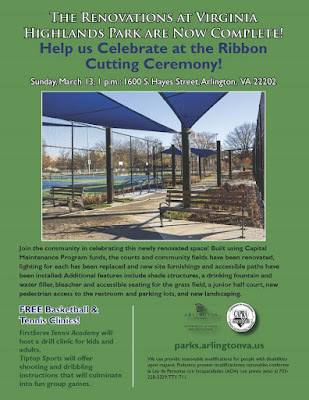 Celebrate at the Ribbon Cutting Ceremony, Sunday March 13th, 1pm - 2:30pm. Virginia Highlands Park is located at 1600 S. Hayes Street, Arlington, VA 22202. The ribbon cutting ceremony will include fun activities for kids and adults including a tennis drill clinic for kids and adults hosted by FirstServe Tennis Academy and a basketball clinic for kids with shooting and dribbling instructions that will culminate into fun group games hosted by Tiptop Sports. About the project: built using Capital Maintenance Program funds, the courts and community fields have been renovated, lighting for each has been replaced and new site furnishings and accessible paths have been installed. Additional features include shade structures, a drinking fountain and water filler, bleacher seating for the grass field, a junior half court, new pedestrian access to the restroom and parking lots, and new landscaping. View the Virginia Highlands Park Ribbon Cutting Flyer. For details about the renovation, visit the project page. The Four Mile Run Restoration Joint Task Force will meet on Thursday, March 10, 2016 at 7:00 PM. The meeting will take place at the Fairlington Community Center, Room 134, 3308 S. Stafford St. Arlington, VA 22206. Alexandria will complete a wetland restoration project this spring on Four Mile Run, and Arlington expects to begin construction on in-stream improvements this summer. Please join us for updates on these initiatives, see photos of the progress on the wetlands project, and hear about the proposed Arlington construction schedule. There will also be updates on the Pedestrian Bridge and projects within the area. January 2016 - The Four Mile Run Park path is now re-opened for pedestrians and cyclists. The wetlands trail will be remain closed until spring when there is dry and predictable weather to complete it. The pink flags will remain in the wetlands for one year in order to deter geese as plants establish. Stayed tuned for a ribbon ceremony date upon full completion in spring 2016. The restoration project is a joint venture to restore 2.3 miles of a highly degraded stream within the hardened flood control channel - or levee corridor - of Four Mile Run. Through a partnership of efforts and funds, residents and staff from Alexandria, Arlington, the Northern Virginia Regional Comission (NVRC), the US Environmental Protection Agency, the US Army Corps of Engineers and Congressman Jim Moran's office have been working collaboratively to successfully implement the framework set forth by the Four Mile Run Restoration Master Plan (2006). A citizen-led Joint Task Force (JTF), with representatives appointed by the chief administrative officers of each jurisdiction, examines project alternatives, gathers public input, and provides recommendations to the project’s Agency Coordination Group (ACG). Members of the ACG represent the various local, regional, and federal government agencies involved in the planning and implementation of the restoration effort. A list of JTF members and an archive of meeting summaries are available on the project website. NVRC is facilitating the administration of the Four Mile Run Restoration Project and additional information related to the project can be found on their website. Among the various summer internships and game staff positions offered by the Alexandria Aces to provide the best fan experience each night at Frank Mann Field at Four Mile Run Park, three in particular remain vacant as of February 29th. Interested personnel from the local area are especially encouraged to apply. These positions are only required for scheduled home games. The Concession Stand Coordinators set up and operate the Aces Concession Stand located adjacent to the Press Box behind home plate. These coordinators: 1) arrange for the delivery or, most likely, pickup of the hot food items (e.g. hot dogs, hamburgers, pizza); 2) run the concession stand; and 3) maintain the inventory of all items offered such as drinks, chips, and candy. Upwards of two personnel are required each game to complete all of the tasks and provide proper coverage of the stand. One of these coordinators will need their own transportation if pickup of the hot food items is required either before each game or during a game if the hot food inventory runs low. The Post Game Meal Coordinator arranges the menu and the delivery or pickup and set up of the Aces post game meal. Reestablished in 2015, the post game meal is either home cooked by one of the Aces fans or purchased by the Aces from a local dining establishment. This coordinator can be dual-hatted as one of the Concession Stand Coordinators provided they have their own transportation available to pickup any meals provided by a local establishment prior to the conclusion of the game. Finally, the Aces are looking for an Official Scorer who not only understands how to properly score a baseball game manually, but is comfortable with scoring the game on the computer, in this case, via Pointstreak. The Official Scorer is required to arrive at the ballpark at least 1 hour prior to game time. Duties include: 1) inserting the starting lineups into the Pointstreak scoring software as provided by the Cal Ripken Collegiate Baseball League (CRCBL); 2) keeping the detailed “live scoring” of the game that is accessible via the CRCBL website; and 3) properly closing out each game at the conclusion of the contest. Past experience as an assigned Official Scorer is not required. Access to a laptop to load Pointstreak is a plus. Of all the Game Day positions, this is most critical as the Official Scorer creates the statistical record that become the historical recap of the CRCBL and impacts player selection to the CRCBL All-Star Game, All League Team and All College Summer Baseball League Teams, in addition to populating professional baseball databases. Official Scorers will be required to complete formal computer-based training on Pointstreak prior to the start of the CRCBL season. If interested in these or any of the other vacant internships, please contact General Manager Lou Nolan at lrnolan@verizon.net.